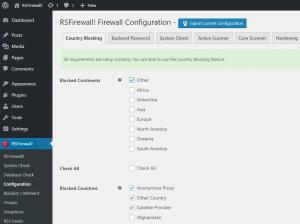 RSFirewall Wordpress - How do I use country blocking and where do I get GeoIP.dat ? Home / Support / Documentation / RSFirewall! 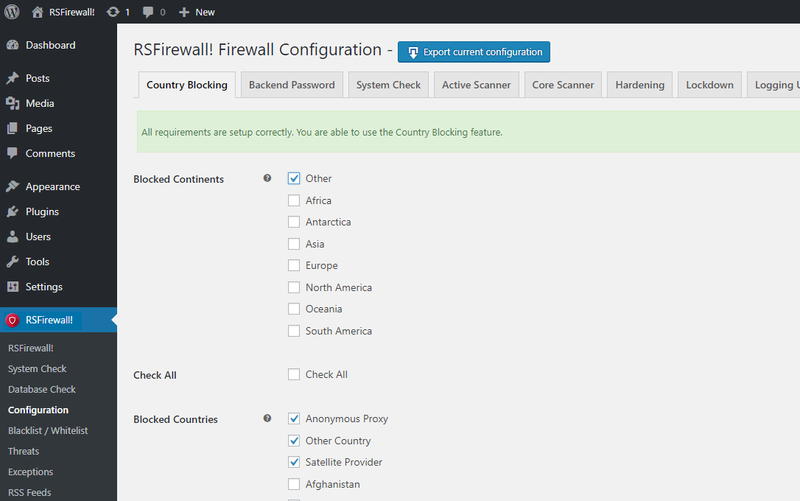 (WordPress) / Frequently asked questions / How do I use country blocking and where do I get GeoIP.dat ? This feature allows you to ban entire IP ranges of addresses that belong to a certain country. The feature can be accessed from: backend > RSFirewall! > Configuration > Country Blocking. Tip: The database is updated every month. It is recommended to re-upload the file periodically. If there's no download/upload button, it implies your server natively supports a geoip database and there's no need to perform these actions.